Subscribe & Save today for 15% off your first shipment! Plus, save 15% on every additional shipment along with free priority shipping. Easily modify delivery schedule and pause or cancel anytime. From the highest quality ingredients sourced globally. VitaMedica’s Healthy Skin Formula has been recommended for 20 years by medical skin care professionals for their patients with mild to moderate non-cystic acne, aged 12 years or older. Two easy-to-swallow, odorless capsules taken daily to obtain skin health benefits. Other Ingredients: Gelatin, magnesium stearate, silicon dioxide and microcrystalline cellulose. Betatene® is a registered trademark of COGNIS IP MANAGEMENT GMBH. TRAACS® is a registered trademark of Albion International, Inc. 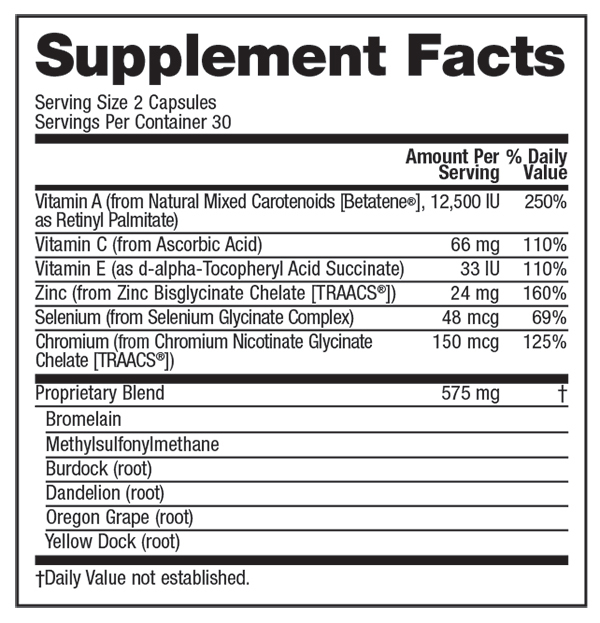 Directions: As a dietary supplement, take two capsules with food. Each individual is unique and nutritional requirements may vary. WARNINGS: Do not take if safety seal on bottle is broken. KEEP OUT OF REACH OF CHILDREN. If you are diabetic, pregnant or breast-feeding, seek advice of your physician before using this product. HEALTHY SKIN FORMULA contains Vitamin A. If you are presently taking any vitamin A containing medications for the treatment of acne, please refrain from taking HEALTHY SKIN FORMULA until the end of the treatment cycle. Not manufactured with wheat, milk, soy, egg, fish, shellfish, peanuts or tree nut ingredients. Produced in a GMP-certified facility that processes other ingredients containing these allergens. 1. What is the primary benefit of using Healthy Skin Formula? Healthy Skin Formula is formulated with nutrients that promote skin health, reduce sebum production, enhance inflammatory control, and have antiseptic properties. 2. What makes VitaMedica’s Healthy Skin Formula product unique? Healthy Skin Formula is designed to address each factor contributing to the formation of acne. Although an inflammatory skin condition such as acne can strike at any age, its onset is most often related to a change in hormones, which explains why certain populations including teens and pregnant women are particularly prone to acne breakouts. Excess androgen production can cause the sebaceous glands to excrete more sebum, which in turn clogs the follicle and allows a bacterium called P. acnes to overpopulate. The result is inflammation and acne blemishes in the form of whiteheads or blackheads, depending on whether the pore is closed or open. Healthy Skin Formula contains zinc to help regulate testosterone – the primary hormone involved in sebum production. Vitamin A (carotenoid and palmitate form) promotes normal epithelization of the skin cells and reduces sebum production. MSM (Methylsulfonylmethane) acts as a natural anti-microbial. Selenium and bromelain are included naturally reduce the inflammation. Finally, Healthy Skin Formula includes several herbs which help to detoxify and cleanse the blood and skin. 3. Can diet affect acne and other skin problems? Yes. Although hotly debated within the medical community in the past, a growing consensus based on increasing research-based evidence agrees that in addition to genetics, hormones, exercise, and stress, diet can be a major factor in many skin conditions including acne. The skin is often referred to as the third kidney for its role in removing toxins from the body, and studies have shown that some patients with acne have intestinal toxemia (toxins build up in the intestine due to poor nutrition) that may be contributing to their condition. Other studies have found that patients with psoriasis and eczema improved their condition with alpha-linolenic (Omega-3) essential fatty acid supplementation. It simply makes sense that the quality of nutrients consumed will affect the quality of an individual’s skin. 4. Who should use Healthy Skin Formula? Healthy Skin Formula is indicated for patients with non-cystic acne. The product is suitable for patients 12 years or older. 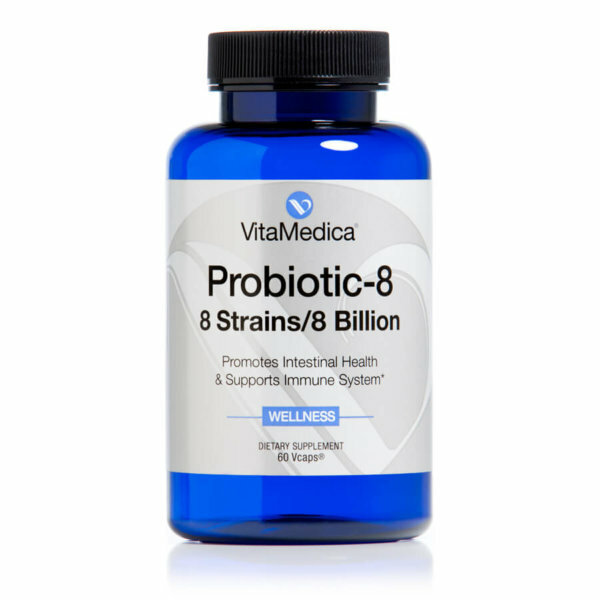 This nutraceutical is ideal for individuals who do not eat a well-balanced diet on a consistent basis. Because of the poor dietary habits of people who are 15-30 years of age, Healthy Skin Formula is particularly well-suited for patients in this age group. 5. Who should not use Healthy Skin Formula? Nutritional supplements have an excellent safety track record. However, certain individuals should seek the advice of their doctor before beginning any nutritional supplement program particularly diabetics, pregnant or lactating women. Healthy Skin Formula contains vitamin A (palmitate). If you are presently taking a vitamin A containing medication for the treatment of acne, refrain from taking Healthy Skin Formula until 6 months after the end of the treatment cycle. Please refer to the Directions section for more information on precautions and contraindications. 6. How do prescription and over the counter (OTC) medications for acne differ from nutritional supplements? Prescription and OTC acne medications can have powerful activity – with significant side effects. Natural medicines tend to be milder, safer, and far less likely to cause negative reactions. Many topical treatments for the care of acne and inflammatory disorders of the skin have been shown to be effective, and yet are limited by only targeting the outermost layers of the skin. The skin is incredibly good at preventing potential pathogens from entering the body, which also means it is extremely difficult for the active ingredients in topical products to penetrate the deeper layers of the dermis. Therefore, it makes sense to use a bi-directional approach that addresses both the external and internal causes behind the formation of acne blemishes by coupling high-quality topicals with a wholesome diet and supplements. 7. Healthy Skin Formula is formulated with vitamin A. Why is vitamin A important for acne? Vitamin A plays a role in skin health because it is needed for the maintenance and repair of epithelial tissue, which forms the skin and mucous membranes. Vitamin A stimulates the growth of the base layer of the skin cells. It also helps cells to differentiate normally and gives them their structural integrity. Vitamin A plays such an important role in dermal health that many topical acne medications are derivatives of this vitamin. 8. Healthy Skin Formula is formulated with vitamin C. Why is vitamin C important for acne? Vitamin C is a water-soluble vitamin that is essential for the development of collagen, the most abundant protein in the body. Collagen provides structural support to the skin. Vitamin C is also a potent antioxidant that works in concert with vitamin E to protect cells from free-radical damage. Research published in 2006 found that reactive oxygen species can damage skin and increase inflammation and scarring related to acne. Ingesting or applying vitamin C may help ward off these damaging free-radicals. 9. Healthy Skin Formula is formulated with vitamin E. Why is vitamin E important for acne? Vitamin E is a fat-soluble antioxidant that prevents the oxidation of fats in the body. The oxidation of sebum, damaged by bacterial growth, may be responsible for the inflammatory aspects of acne. Vitamin E prevents irritating oxidation of sebum. Vitamin E is important for the proper functioning of vitamin A, a key acne vitamin. 10. Healthy Skin Formula is formulated with vitamin A from palmitate and a carotenoid source (Betatene®). Why are both forms provided? Both forms are provided to ensure safety and efficacy. As a fat-soluble nutrient, vitamin A is stored in the liver and fatty tissue of the body. This creates a concern if too much of this vitamin is taken over time (e.g. upwards of 50,000 IUs daily for over 3 months). Healthy Skin Formula is formulated with a modest dose of vitamin A (12,500 IUs total), provided in both the palmitate (7,500 IUs) and carotenoid (5,000 IUs) form. While palmitate is directly utilized as vitamin A, carotenoids must convert into vitamin A to be used by the body. The conversion process for the few carotenoids that have pro-vitamin A activity is not very efficient. For example, six to twelve times more beta-carotene is required to convert into one retinol unit of vitamin A activity. That is why toxicity is not an issue with a carotenoid source. By providing both preformed vitamin A (palmitate) and a natural, mixed blend of carotenoids (Betatene®), Healthy Skin Formula delivers an efficacious, yet safe dose of vitamin A to support healthy skin function. 11. Healthy Skin Formula is formulated with zinc. Why is zinc important for acne? Zinc is a trace mineral that is essential for protein synthesis and collagen formation. Zinc is involved in the proper metabolism of testosterone, the principal hormone involved in the genesis of acne through its role in sebum production. The mineral is also involved in vitamin A function, wound healing, immune system activity, inflammatory control, and tissue regeneration. 12. Healthy Skin Formula is formulated with selenium. Why is selenium important for acne? Selenium is an antioxidant that works to protect other antioxidants such as vitamin E and is important in keeping tissues elastic. Research has also shown that a deficiency in selenium may play a role in inflammatory conditions such as eczema and psoriasis. Selenium functions in glutathione peroxidase, an enzyme which is very important in preventing the inflammation of acne. 13. Healthy Skin Formula is formulated with chromium. Why is chromium important for acne? Chromium is a trace mineral that works with insulin in the metabolism of sugar and is needed for energy. Chromium also improves glucose tolerance and enhances insulin sensitivity. This is important for some acne patients who do not metabolize sugar properly. 14. 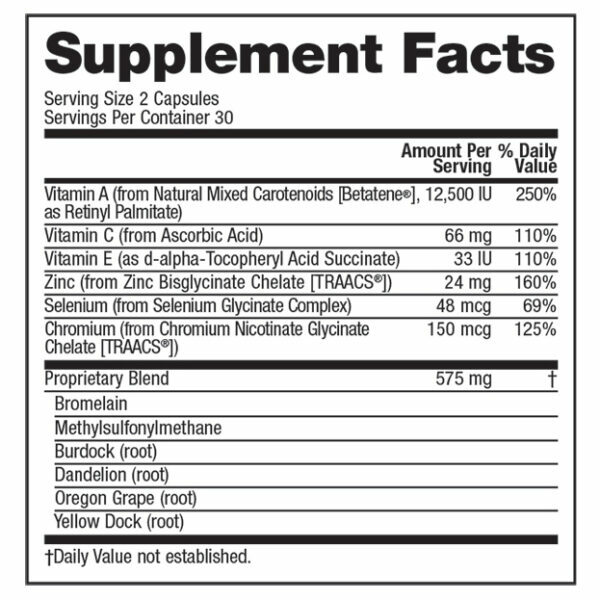 I noticed in the Supplement Facts panel the word chelate after each mineral. What does chelate mean? In general, our bodies absorb vitamins without much difficulty, but minerals are not absorbed as well. Chelation is a process that combines a mineral with an amino acid. This process of chelation enhances the absorption of minerals by fooling the body into thinking it is absorbing the amino acid attached to the mineral. The mineral is pulled into the body along with the amino acid, ensuring its absorption. Chelated minerals are more expensive because of the extra step required to attach the amino acid to the mineral. However, this expense is worth it due to the improved absorption. 15. Healthy Skin Formula is formulated with bromelain. Why is bromelain important for acne? Bromelain is a proteolytic enzyme (digests protein) that is extracted from the stem of the pineapple. Bromelain contains compounds that support a healthy inflammatory response. 16. Healthy Skin Formula is formulated with MSM. Why is MSM important for acne? MSM or methylsulfonylmethane is a natural form of organic sulfur that is necessary for collagen synthesis. MSM is critical in building the sulfur amino acids methionine and cysteine. MSM is also a natural antiseptic that works as an antimicrobial. MSM enhances tissue pliability and encourages the repair of damaged skin. By keeping skin cells soft, MSM allows the skin to detoxify. The combination of MSM and vitamin C works faster to heal wounds. 17. Healthy Skin Formula is formulated with several herbs. Why are these herbs included and what is their importance for acne? The skin has several functions including temperature regulation, protection of the underlying tissues, fat storage, and immunity. Along with the kidneys, the skin also plays a role in eliminating toxins from the body. In fact, the skin is often referred to as the “third kidney”. The elimination of toxins through the skin can promote the development of acne. Herbs like burdock, dandelion, yellow dock, and Oregon grape, are included in Healthy Skin Formula for their potent cleansing properties of the skin and blood. 18. What other VitaMedica products may be beneficial to support a clear-complexion? Healthy-looking skin that is clear of acne reflects a health-promoting diet rich in fruits, vegetables, as well as high-quality protein and fat sources. 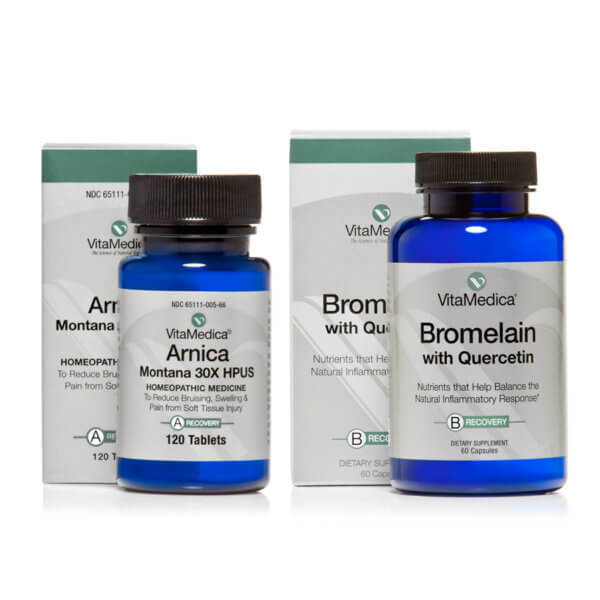 VitaMedica’s nutraceuticals are designed to help cover any nutrient gaps that may remain, and target specific health objectives. Healthy Skin Formula and Clear Skin Formula provide nutrients to banish blemishes from the inside out and promote a clear complexion. Anti-Aging Formula, our most popular product, includes our high-quality Multi-Vitamin & Mineral plus our Phyto-5 Phytonutrient Complex and organic flax seed oil in 30 convenient daily packs. Our US-based wellness advisors are here for you Monday–Friday, between 8 am and 5 pm PST. One reason doctors recommend us is that years of clinical practice inform our nutraceuticals: As a respected leader in the beauty and wellness space, our premium-quality products are guided by science and proven through clinical experience. 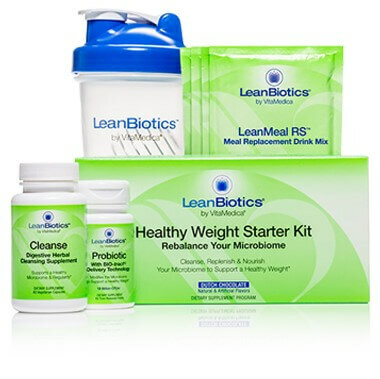 Clinician-originated nutraceuticals targeted for recovery, weight management, beauty and wellness. The preferred choice for thousands of doctors and millions of patients for more than 20 years. The highest-quality raw materials from all over the world, manufactured at our GMP compliant U.S. facilities. US-based customer service team helps you make the right choices for your needs, and handles all questions. Take a full 60 days. We’re certain you’ll be satisfied with your VitaMedica purchase. 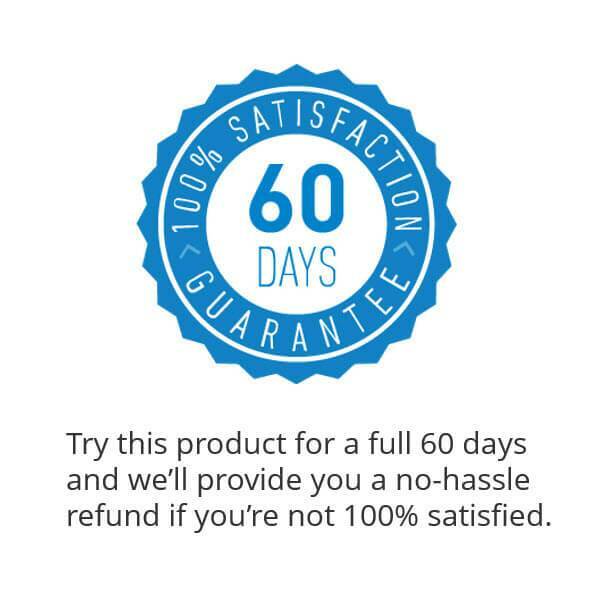 Which is why we offer a 60-day money-back guarantee on your purchase. If you’re not 100% happy for any reason, contact our customer support team and we’ll take care of everything. We’re certain you will be satisfied with your VitaMedica purchase. Which is why we offer not just 30 days, but a 60 day money-back guarantee on your purchase.